INTERIOR.................... STAINLESS STEEL, TYPE 304, POLISHED, ALL SEAMS BONDED AND CORNERS ARE COVED WITH A ¼” RADIUS. EXTERIOR................... STAINLESS STEEL, TYPE 304, POLISHED. SHELVES.................... PERFORATED STAINLESS STEEL ADJUSTABLE SHELVES WITH SPILL GUARDS. ELECTRICAL............... 115V/60HZ/1PH., OR 115V.D.C. WITH OPEN TYPE COMPRESSOR. 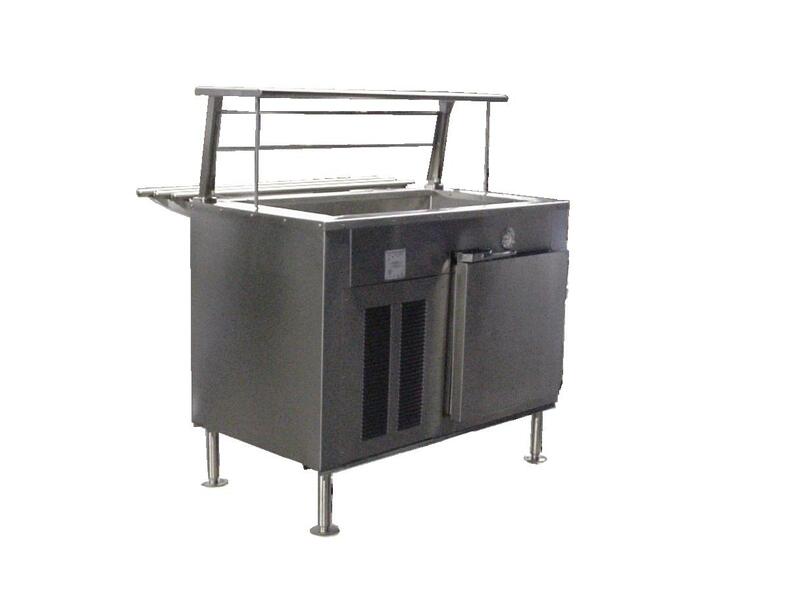 THESE COLD FOOD COUNTERS ARE DESIGNED AND CONSTRUCTED FOR SHIPBOARD USE IN ACCORDANCE WITH MILITARY SPECIFICATION MIL-C-43300. REFRIGERATED COMPARTMENTS ARE EQUIPPED WITH BLOWER TYPE EVAPORATORS. FOOD PAN WELL HAS COLD WALL EVAPORATOR. HERMETICALLY SEALED CONDENSING UNIT, R-134a REFRIGERANT, INDEPENDENTLY CONTROLLED REFRIGERATION SYSTEMS AND 2” DIAL THERMOMETER. FRONT AND REAR LOUVERED PANEL IS REMOVABLE TO ALLOW ACCESSIBILITY FOR SERVICING OF EQUIPMENT LOCATED IN THE CONDENSING UNIT COMPARTMENT. EACH CABINET IS EQUIPPED WITH 7-½” REMOVABLE MOUNTING LEGS AND A 3/16” CHANNEL BASE FRAME FOR DECK MOUNTING.